Anathema is a very susceptible rock band that has changed it's stile relentlessly over the years. However their themes and motives have remained the same in spite of the variety of genres experimented by the band. 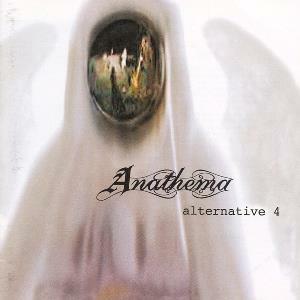 Alternative IV is one of Anathema's best records and it focuses on a gothic metal style taken to progressive standards. The first song is entitled "Shroud of False" and it features some excellent piano playing by the former My Dying Bride and Cradle of Filth keyboard an violin player, Martin Powell. The atmosphere is depressive, nevertheless, and it initiates the listener into an emphatic musical experience. The intro explodes in the end with bombastic guitar riffs... A perfect intro. "Fragile Dreams" is under constant pressure. It somehow continues the unfinished musical line of the first track by adding more elements to it. At first the piano receives violin backup and the guitar switches to acoustic from time to time. The lyrics are ok and in a strong correlation with the melody. The structure of the song is not special at all, but it's the composition that leaves a great artistic impression. "Empty" is place strategically as the third track because it is the most dynamic song of the entire album. It's message can be translated within one word and one word only:FRUSTRATION. Strong bass gives that particular depressive attitude accompanied by wild guitar riffs and drums that blast off the air into the listener's ears. The climax of the track contains, surprisingly, a slow, melancholic piano that haunts the tensioned musical atmosphere, giving a strong feeling of relief, only to be followed by extreme agonizing metal acoustics. In antithesis with "Empty", "Lost Control" is generally a rock ballad that features,once again, a lonely monotonous piano that sometimes is disturbed by the bass. The lyrics are very clear and intelligible which is why I believe that they are the main element of the song. However, the end is marked by great violin interpretation. "Re-connect" is a classical metal track. It is special in it's own way, but I didn't enjoy it as the rest. A notable aspect of this song is that the solo guitar goes into psychedelic sound. In my opinion, "Inner Silence" is an interlude that reattaches the first impressions of the intro to the core of the album. Although not very spectacular, the song is intelligently put in the middle and somehow reviews the first part of the record in order to prepare the listener for what is to come. "Alternative 4" is a masterpiece of music about which many might say it pays tribute to psychedelic rock. I don't really agree, because in spite of the fact that the music is very profound, it doesn't cause any state of euphoria. It is as depressive as a song can get especially with those echoing drums and psychological keyboards on top of which stand strong and aggressive guitar riffs. Anathema is a band strongly inspired by Pink Floyd. This is obvious in "Regret". Comparing it to other moments of the record, "Feel" is quite an ecstatic song. It's style is familiar with Lake of Tears'. The outro consists of "Destiny", a song marked by melancholy and a certain feeling that the album needs to be re listened. The voice goes over the melodic background amplifying the emotional atmosphere. In conclusion, "Alternative 4" is a great album with a very good production but with lack of complexity which is why I cannot rate it as a masterpiece of prog music.